That’s the question my sister asked me when I told her last year that I was thinking about getting another big loom. It’s a reasonable question. A loom is a big expense. It takes up a lot of space. There’s only one of me and I can only weave on one loom at a time. So why get another one? There’s no short answer, really. Weaving is just making threads go up or down to produce fabric. This can be done with your fingers, on frames, with back straps, even pieces of cardboard with slits cut in it. How many of us, as kids, wove those ubiquitous little pot holders with knit loopers on metal frames? Looms are tools. Weavers use them to create the fabric that is in their heads. The real question is what do we want to weave? That determines the loom. Most weavers learn on jack looms. When you step on a treadle, the shafts connected to it are jacked up, the others stay down. That’s how the shed is made. Each treadle controls any number of shafts, making design possible. 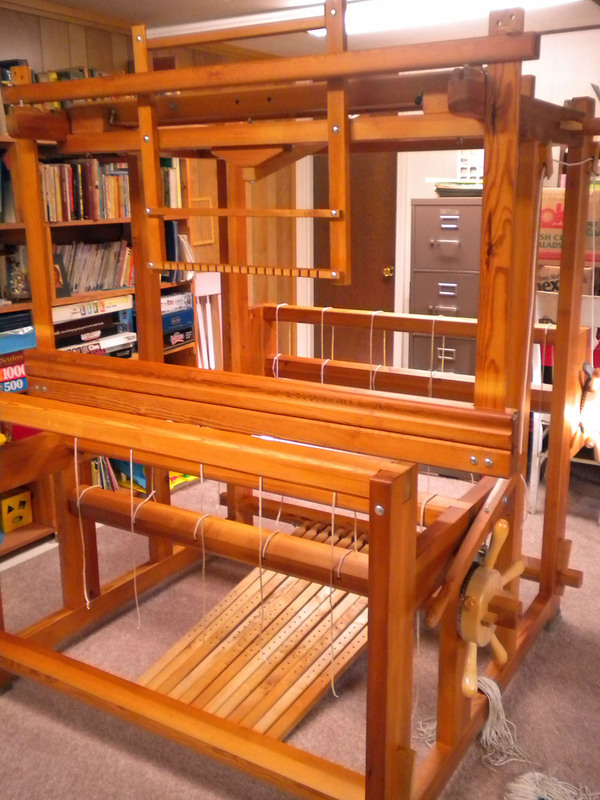 My first loom was a four-shaft Harrisville jack loom, 22” weaving width, a good starter loom. 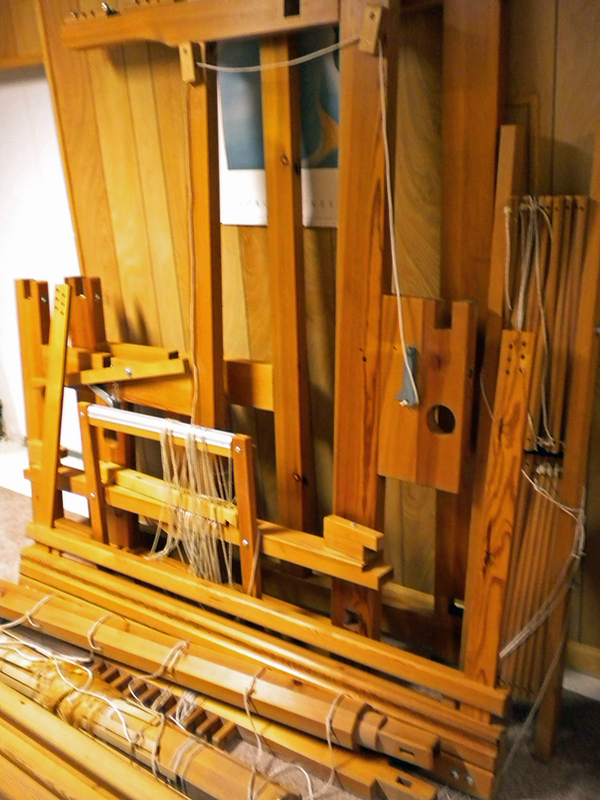 Many old rug looms and barn looms are counterbalance looms. Each shaft is tied to an opposing shaft so that when the treadle tied to the first shaft is depressed, that shaft goes down and the opposing shaft goes up. 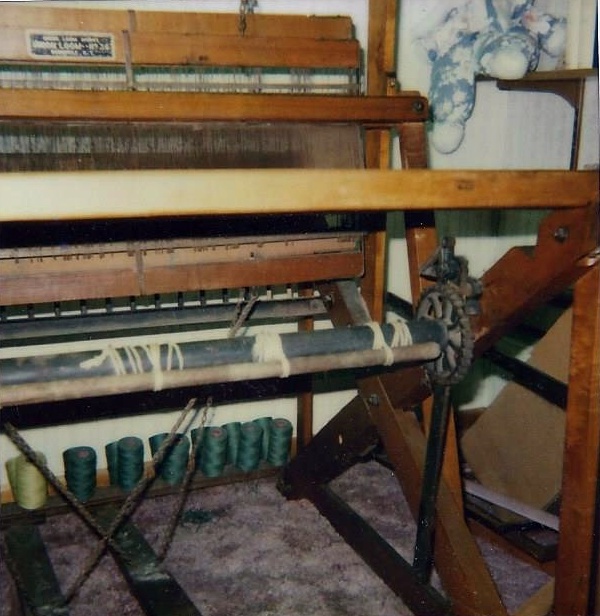 My grandmother’s old Union loom was a 2-shaft counterbalance loom. 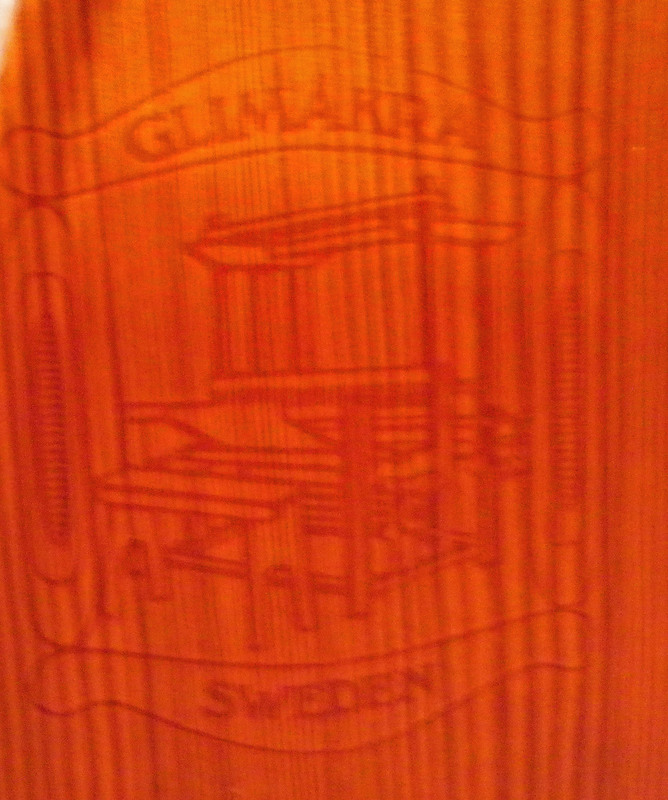 Many Swedish looms are either counterbalance or countermarche. 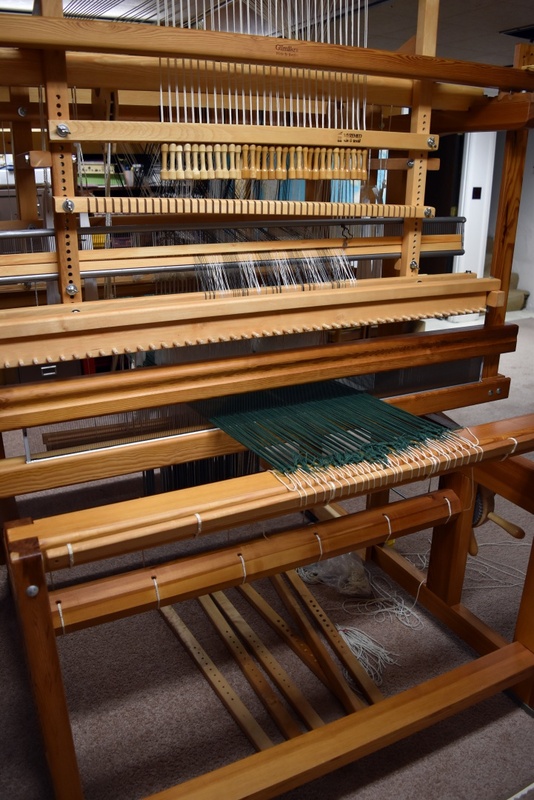 On countermarche looms, when a treadle is depressed, every shaft goes either up or down. Every shaft is tied to every treadle. 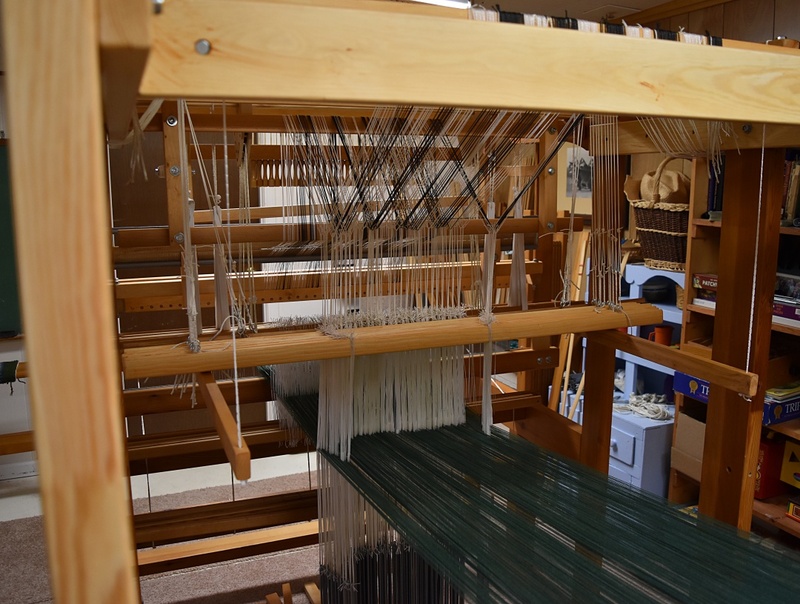 This opens the shed in both directions, up and down, and is easier on the warp threads. It’s also easier to treadle designs with lots of heddles on individual shafts. Countermarche tie-ups, every treadle on every shaft. When I bought my first big loom, my intention was to get the one loom that would do whatever I wanted to weave forever and ever, amen. But how was I to know what directions my weaving would take at this early point? 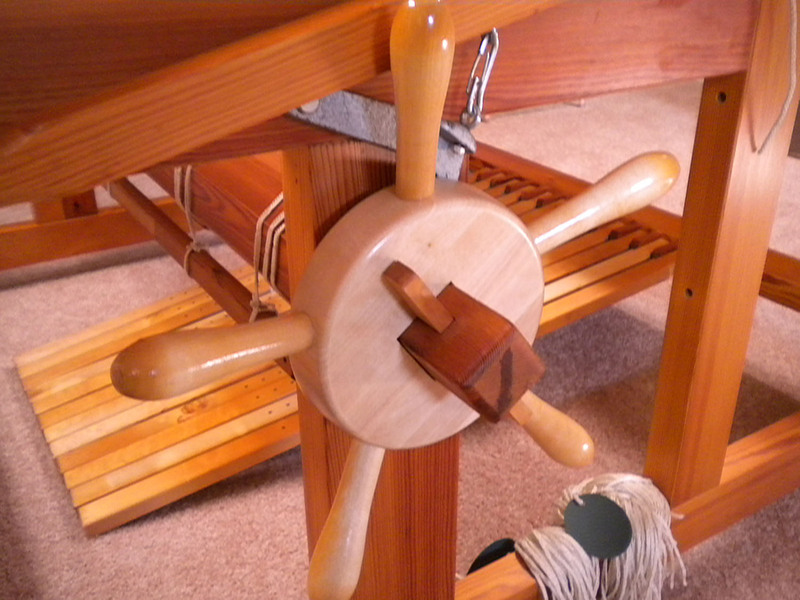 Besides my little Harrisville, I had woven on Glimäkra countermarche looms at a week-long class and really liked how sturdy they are, the overhead beater, the treadling action. 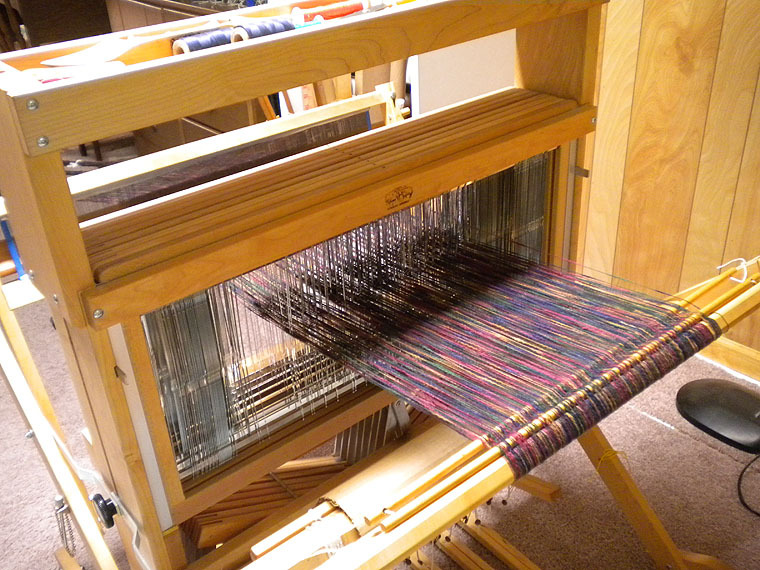 During that week, I also wove samples on both a single-unit drawloom and a shaft drawloom. 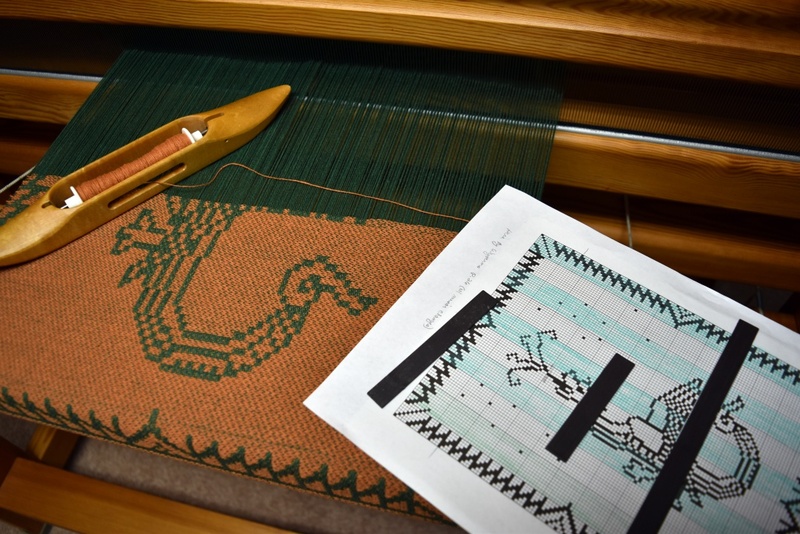 Drawlooms add a whole world of possibilities to weaving. 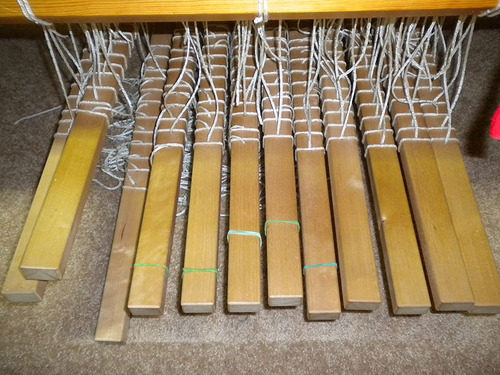 A drawloom has a set of shafts separate from the ground shafts. 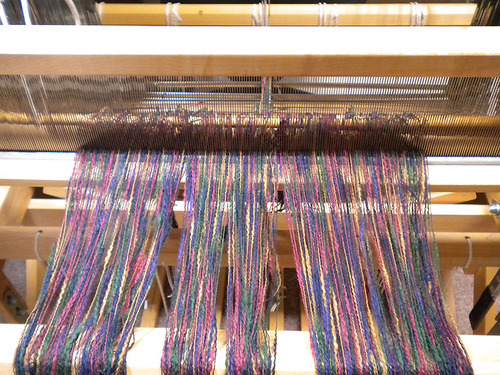 The shaft drawloom produces repeating designs across the warp. These can be symmetrical or mirrored, tiled or single figures. The single unit drawloom lets you lift individual units to produce asymmetrical non-repeating designs. After some careful thought, I chose a Glimäkra countermarche loom with a 20-shaft drawloom attachment to grow into. But a couple years ago, I thought a second big loom would be very useful. 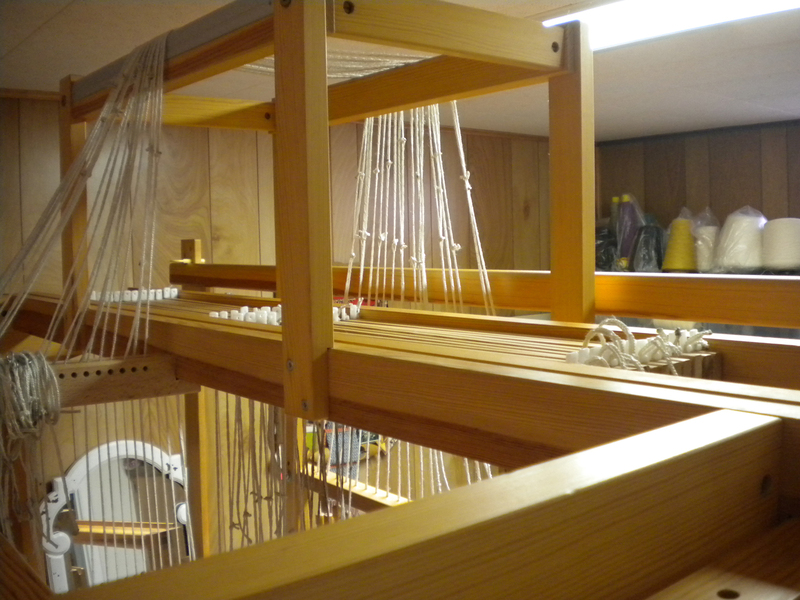 The drawloom setup is different than the regular set-up and every time I needed to switch from one to the other, it took a day to change heddles and rebalance the loom. It would be more efficient if I could have one loom as my regular loom and one loom set always as a drawloom. That was the short answer to my sister’s question—efficiency and productivity. And now I am getting closer to that goal of a dedicated multi-shaft loom and a dedicated drawloom. This week I ought to take delivery on a combination shaft and single-unit drawloom. 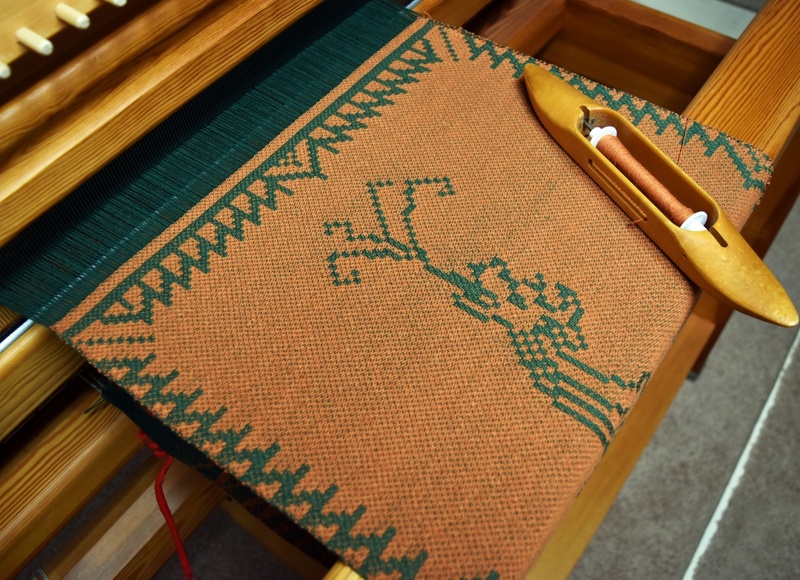 This set-up fits onto my second loom and will allow me to continue weaving the damask designs I’ve been doing, as well as adding single unit motifs. I’m thinking of flowers, birds, dragons, even words. I can hardly wait to see what this new set-up will do. Always learning, always growing. Madelyn van der Hoogt’s The Complete Book of Drafting for Handweavers (1993, Shuttlecraft Books). Sara von Tresckow’s When a Single Harness Simply Isn’t Enough (2014, The Woolgatherers, Ltd.) describes in detail the workings of drawlooms. The Book of Looms by Eric Broudy (1979, University Press of New England) presents a good history of looms of all kinds from around the world. Looms are pretty amazing machines. There are many moving parts other than the shafts themselves. There are also the treadles, the lamms and jacks which make the shafts move. The cloth beam and the warp beam also move, just not as much. And like all machines with moving parts, you have to lubricate them from time to time. 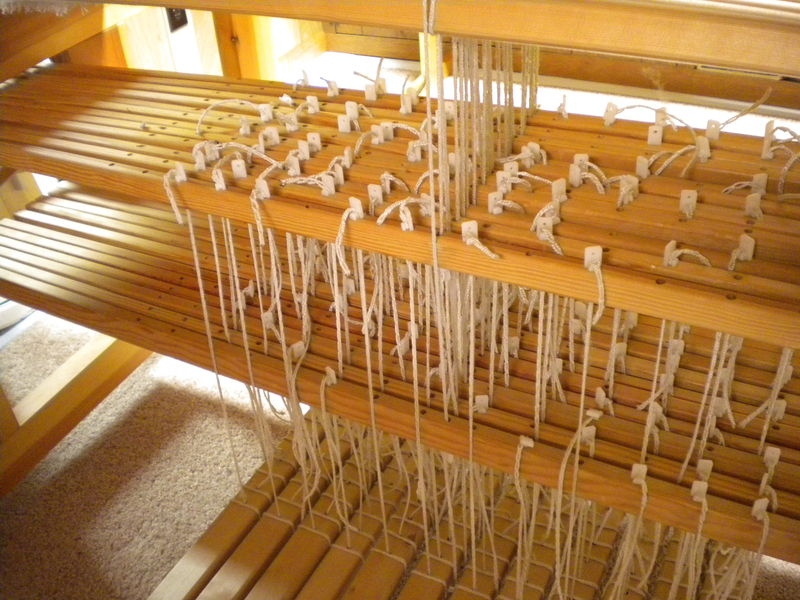 Most looms are also constructed of wood and wood needs “feeding”, especially in the winter when the air tends to be drier. A couple years ago, Tom Knisely, the general manager and weaving instructor at the Mannings in Pennsylvania, came out with a video on this very topic: “Loom Owners Companion.” He covers several different types and makes of looms, discusses how they work and how to keep them working well. It’s a great resource for anyone looking into getting a loom, but also good for those of us who need to keep our looms working well. 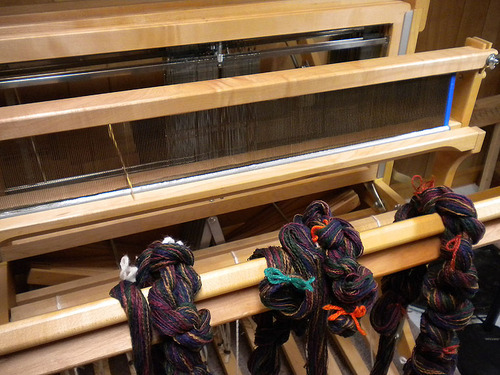 First step is to vacuum thoroughly in and around the working parts of the loom. I’m not talking just about the floor – that does get cleaned regularly—but inside the moving parts, between the shafts, by the lamms, over the jacks. It’s amazing how much lint accumulates inside a loom! Once the loose lint is removed, I can get to the joints and lubricate them. 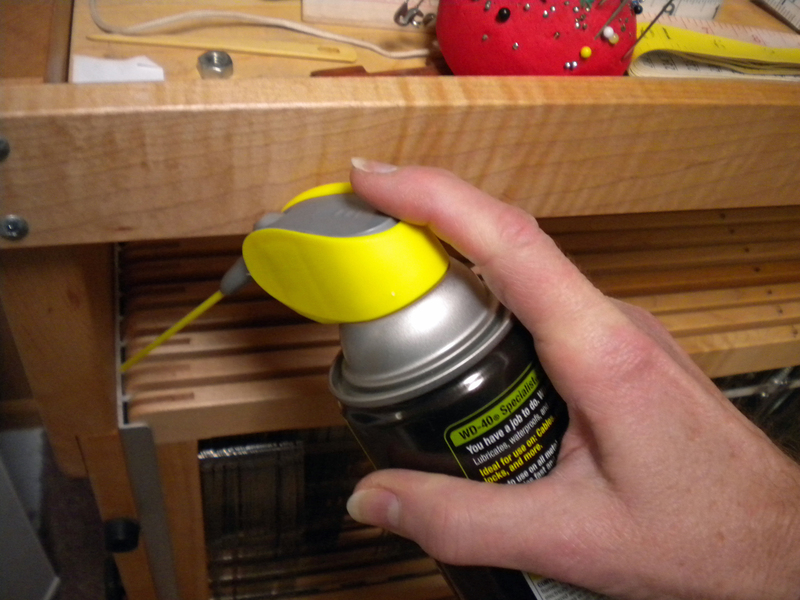 Following Tom’s suggestion, I use a silicon spray on the metal parts, especially where the shafts move up and down regularly on the small loom. Then I tighten all the nuts and bolts. Finally, I clean the wood and give it a good rub-down. Now that I’ve cleaned and polished both of my “babies”, I’m ready for the next warps. 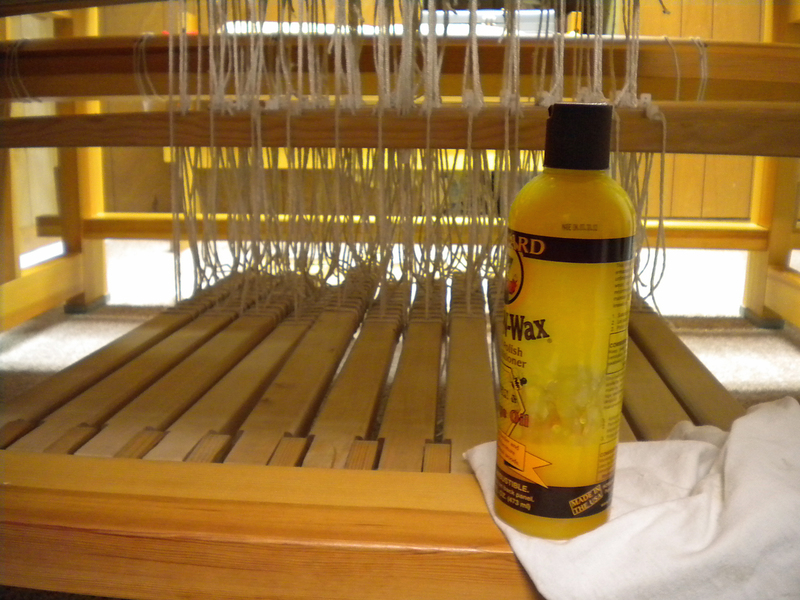 With a little TLC once in a while, I hope my looms weave smoothly for many years to come. Many years ago, I heard a well-known weaver speaking at a conference. He joked that whenever he wanted to change threadings, he just went out and bought another loom. At least I thought he was joking and all us in the audience laughed with him. But now I wonder if, indeed, he was just being honest. 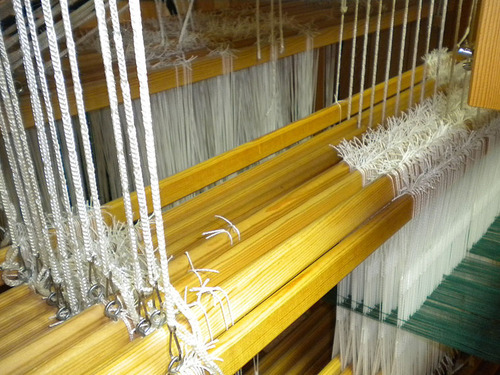 You see one of the most time-consuming tasks of weaving is threading the loom. 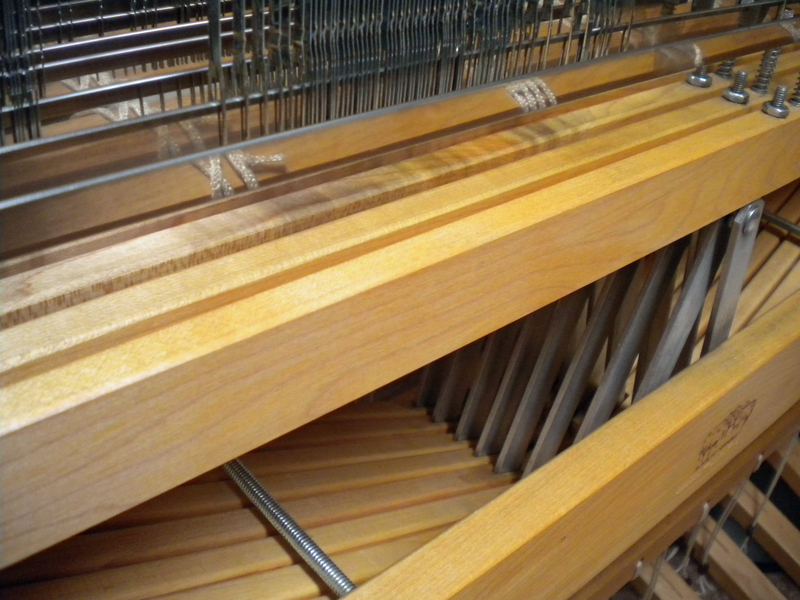 Each thread has to go through a heddle and a dent (a slot) in the reed (the beater). Patterns weaves like damask and double go through two heddles and the reed. Some warps have hundreds of threads. So for that conference speaker, it was more cost-effective to buy another loom than to keep rethreading every time he needed to change patterns. I don’t think I can make the same argument. One alternative is to put on very long warps. For me, “very long” is defined as 20 yards. One of my friends routinely puts on 21 yards. Some weavers put on 50 or more yards. 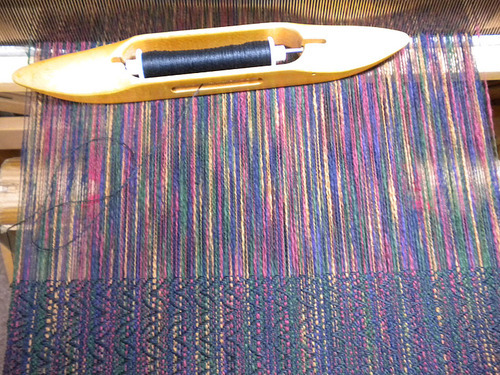 The longer the warp, the more fabric you can weave before you have to re-thread. But what if I get bored with the pattern after 10 yards and there are 20 more to go? What if I get an order for something that needs that width, but there are 20 more yards to weave before I can change warps? 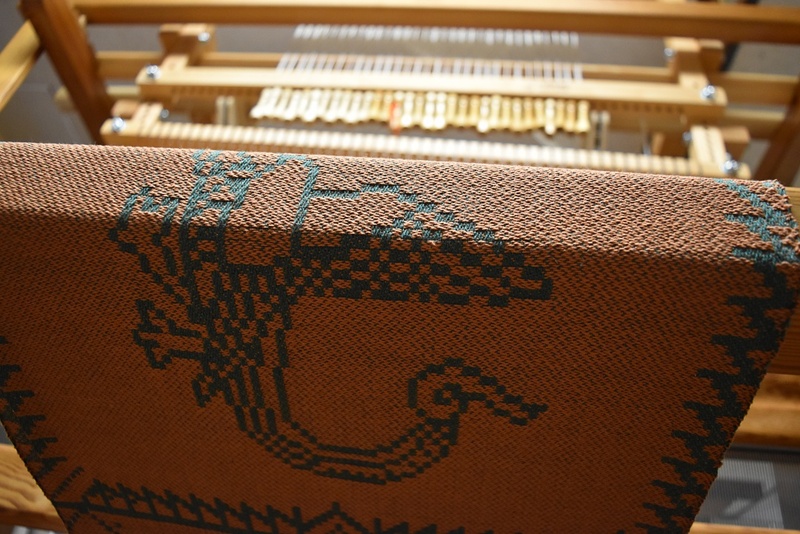 Loom threaded with damask, using drawloom shafts. Earlier weavers had a solution for this. Their looms had pieces that could be interchanged. There are references in their records to “gears” which controlled the pattern. 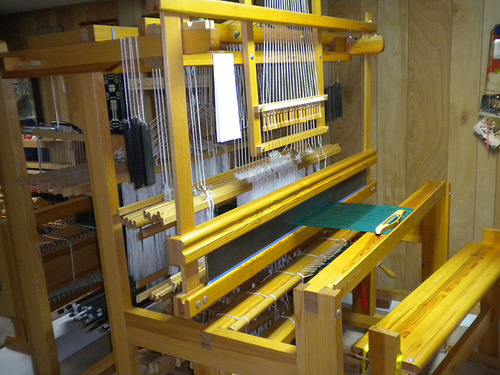 When they needed to weave an overshot coverlet, they put that “gear” into the loom frame and tied on a new warp. If they needed to weave dimity, they stalled that “gear.” So it sounds like they had a limited number of loom frames and multiple “gears” to weave the various patterns they offered. I’ve tried to imagine what these gears were. I have an antique Newcomb loom which has a cast-iron device that changes the shed and advances the warp every time the beater is pulled. Is this what they are talking about? If so, it would be pretty heavy to change out when a new order came in. Or are they referring to the actual shafts with heddles? 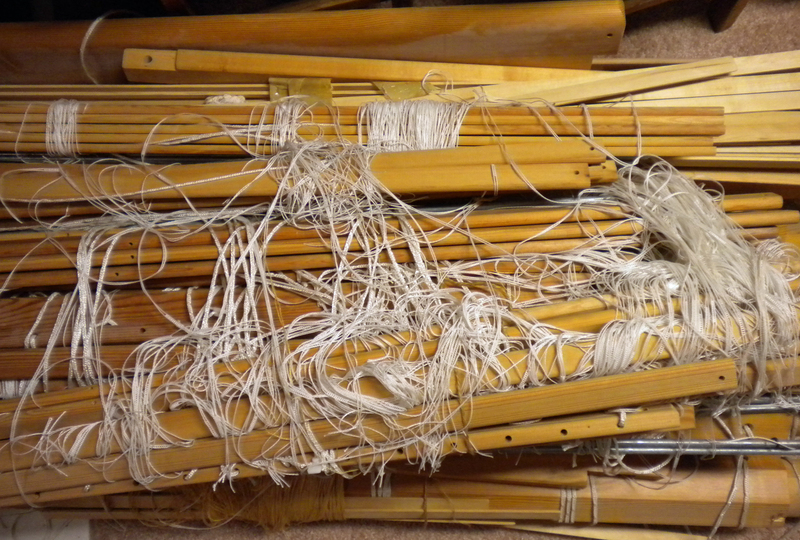 I can see bundling my threaded shafts and carefully rolling them up to preserve a threading, but it would work better if I kept the threads in the reed and bundled the reed with the shafts. That requires extra reeds. All this discussion is really an attempt on my part to fend off “loom envy.” For the past year, I’ve vacillated about getting another loom. I’ve pretty much decided that it’s not necessary, but there are times when I really could use another wide loom. A girl can dream!